These were the words of a third-grade student as shared by Ron Baghetto, a creativity researcher, during his session on “Possibility Thinking” at SXSWedu. I chuckled, captured the statement and shared it via Twitter. In most cases, worksheets represent the drudgery of learning in schools and this student comment captured that sentiment perfectly! What I wasn’t prepared for was the immediate reaction to this tweet. 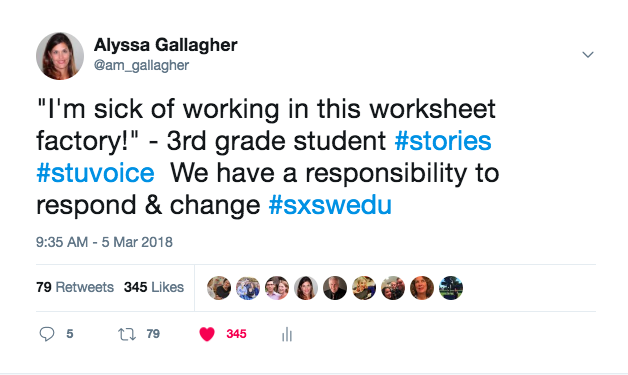 Within minutes, there were hundreds of favorites, retweets, and comments from educators and parents who have witnessed a similar student response to worksheet learning. The quick response both surprised and saddened me. Part of the reason I look forward to attending SXSWedu is that it attracts one of the most forward-thinking and optimistic groups of educators nationwide. Every time I have had the privilege of attending, I have felt like I found my people and yet even among this very forward-thinking group of educators the “worksheet drudgery” experience resonates. I’m not intending to get into an argument about the merits of worksheets, sure there are probably some worksheets that are valuable(? ), but we know most worksheets don’t equate to true learning. Yet we allow (encourage? ignore?) the practice to continue. Why? If we know better, why aren’t we collectively able to do better? Isn’t this an opportunity for us to impact change? I know we are focused on bigger education issues—equity, poverty, innovation, digital divide… the list goes on and on. But I can’t help but wonder how we can eradicate the drudgery of worksheets that students are experiencing daily. Sure it’s a small change, but it is defining the learning experience for children in schools everywhere and it’s turning students off to school and more importantly turning them off to learning. I’d love to hear about your worksheet experiences. How have you made an impact in this area?